from Britain, or the icy-covered Grandfather Frost from Old Russia, there are traditions and spirits from all over the globe. 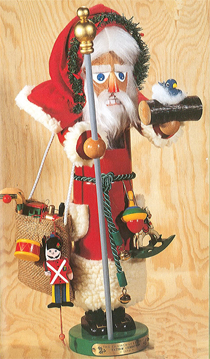 In 1993 Steinbach was thrilled to introduce the Father Christmas (ES645) nutcracker into the Steinbach Christmas Legends Nutcracker Series. Seen here is the traditional American Santa Claus. 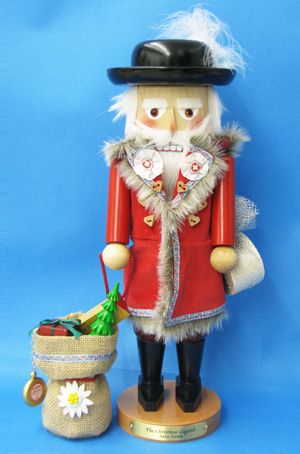 This nutcracker wears the traditional red and white fur trimmed cape and outfit. This look is borrowed from the mythology of English-Irish cultural lore. Father Christmas is portrayed as the bringer of gifts and toys for children the whole world over. Father Christmas represents the rebirth or renewal of life even in the dead of winter. 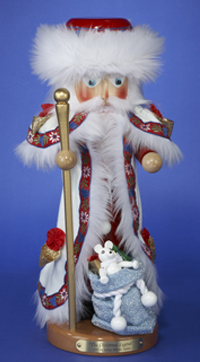 Saint Nicholas (ES865) second in the Steinbach Christmas Legends Nutcracker Series sold out in 1996. This nutcracker stands at 19 inches. This nutcracker represents the patron saint of children. Saint Nicholas’ spirit will live on every year to bring you peace, joy and good will to all. This nutcracker is dressed head to toe in red and holds a Christmas tree in one hand and a golden staff in the other. He was a limited edition piece of 7,500 pieces. 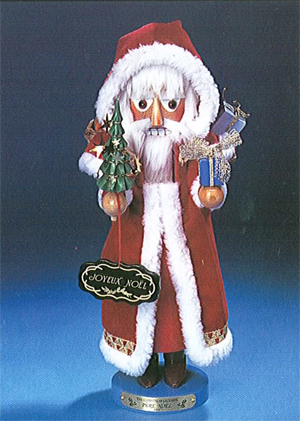 The 1930’s Santa (ES891) was introduced in 1995 and became the third edition to the Steinbach Christmas Legends Nutcracker Series. This jolly nutcracker was limited to 7,500 pieces. 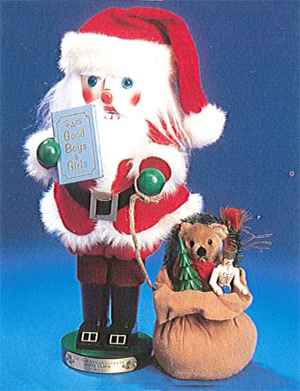 Dressed in the traditional Santa outfit of a red and white fur trimmed coat and black boots, this nutcracker holds the list of the names of all the good little boys and girls. On his head he has his red stocking hat and holds onto a bag filled with toys ready for his Christmas Eve ride. 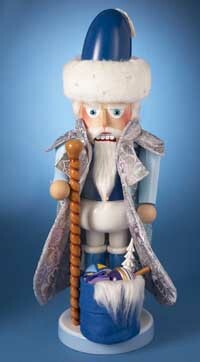 Grandfather Frost (ES895) is the fourth in the Steinbach Christmas Legends Nutcracker Series. He was introduced in 1997. This nutcracker represents the frosty image of the traditional gift giver. Grandfather Frost was limited to 7,500 pieces. 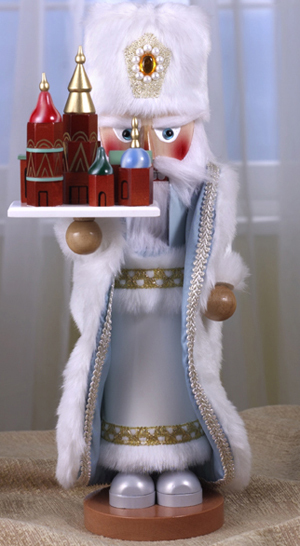 As a Russian interpretation, Grandfather Frost wears icy blue robes and wears a faux-fur trimmed hat. Another enchanting addition to the Steinbach Christmas Legends Nutcracker Series appeared in 1998 in the stately and elegant figure of Pere Noel (ES1822). As the French interpretation of the Jolly Saint Nick or Father Christmas figure, he brings tidings of joy and good will to all during the holiday season. 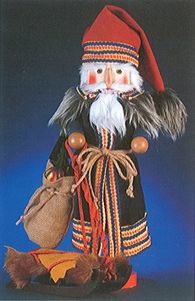 The traditional Pere Noel is clothed in flowing red or white fur robes and carries a small Christmas tree over his shoulder. Upon his back he carries a thatched straw bag overflowing with toys as he bellows “Joyeux Noel” or Merry Christmas in French. Pere Noel is a merry, white bearded symbol of Christmas. His gifts are hidden not in a sack but in a basket strapped to his back. Standing at 17 inches tall, Pere Noel is the fifth addition to the popular Christmas Legends Nutcracker Series and was limited to 7,500. “Frohe Weihnachten (Happy Holidays)”, chimes the happy Bavarian Santa (ES1827). 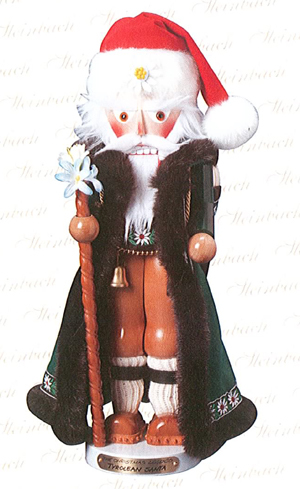 This German inspired nutcracker version of the Father Christmas figure is the sixth edition to the Steinbach Christmas Legends Nutcracker Series. This traditional jolly figure is a plump Santa who wears traditional lederhosen with authentic suspenders. His bright red hat and his flowing white beard tip us off to his true identity. The large sack of toys helps too! Otherwise he looks like a typical German fellow enjoying a beer during Oktoberfest and celebrating one of Germany's most famous festivals. 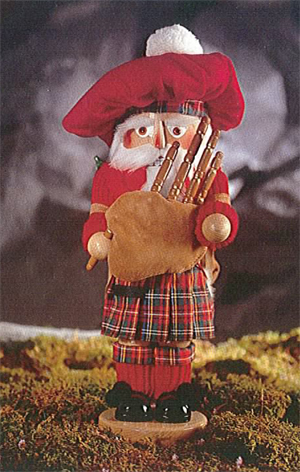 In 2000 Steinbach released into the Christmas Legends Nutcracker Series, Duncan the Scottish Santa (ES1829). Duncan made waves with his sporty kilt, bagpipes and festive red hat. As he roams the moors of old Scotland, he brings gifts of joy and celebrates the true meaning of Christmas. 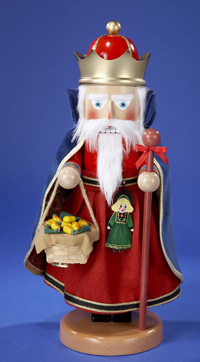 This nutcracker is the seventh addition to the Steinbach Christmas Legends Nutcracker Series, standing at 17.5 inches high and was limited to 7,500 pieces. The images of Santa from all around the world continue to inspire this amazing Steinbach Christmas Legends Nutcracker Series that began in 1993. Traveling all around the globe from Germany to Scotland, Steinbach landed in Ireland in 2001 with a charming and whimsical interpretation of Ireland’s patron saint. The enduring legends of Saint Patrick relate that he used a shamrock to explain the Trinity and that he banished all snakes from Ireland. Saint Patrick traveled widely, baptizing, confirming, preaching and building churches, schools and monasteries. This version of St. Patrick as a nutcracker wears a traditional green fur trimmed robe vest and pants. His top hat sports a snappy shamrock and a pot of gold sits at his feet. 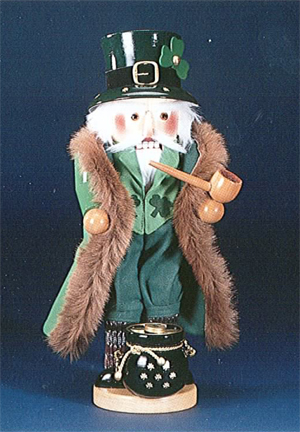 Patrick O’Santa (ES1835) stands about 17 inches tall and plays the tune “When Irish Eyes are Smiling.” This piece is the eighth in the Christmas Legends Nutcracker Series and was limited to 7,500 pieces. 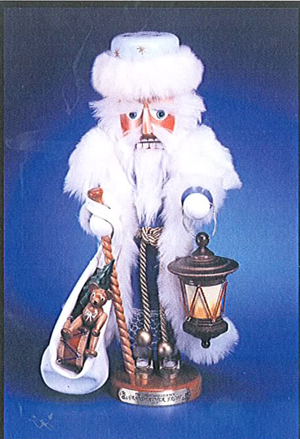 In 2002 the Steinbach Christmas Legends Nutcracker Series welcomed a nutcracker that came from a county rich in tradition and folklore. 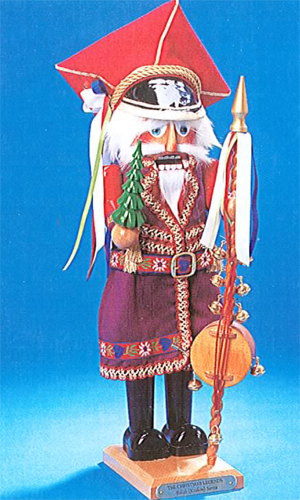 The Polish Santa nutcracker (ES1834), became the ninth in the series. This nutcracker was limited to 7,500 pieces and plays a traditional Polish polka. The highlight of the Christmas celebrations in Poland is Christmas Eve as the family watches for the first star of the night or Gwiazdka (Little Star), in remembrance of the star of Bethlehem. The moment the star appears, everyone exchanges greetings and good wishes. Families unite for the most carefully planned meal of the year called Wigilia, the Christmas supper, which ends a 24 hour fast. According to tradition, bits of hay are spread beneath the tablecloth as a reminder that Christ was born in a manger. Also an empty place setting is left at the table for a stranger, the spirit of a deceased member of the family or the Holy Spirit. Traditionally there is no meat served during the Wigilia, yet the meal is plentiful and luxurious with dishes like dumplings, varieties of fish and noodles with poppy seeds. 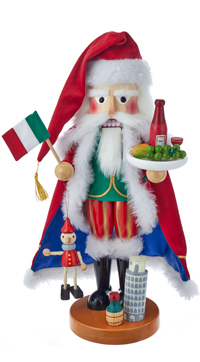 “Buon Natale!” Many say that the tradition of the Christmas feast originated in Italy and so the Steinbach Christmas Legends Nutcracker Series continued with its tenth addition, the colorful and musical Guiseppe, the Italian Santa (ES1836). The colors on his hat are those of both the Italian flag and Christmas. Coincidence? We’ll let you decide. Guiseppe was limited to 7,500 pieces and plays the Italian classic “O Sole Mio”. Coming all the way from Austria is the thirteenth addition to the Steinbach Christmas Legends Nutcracker Series. 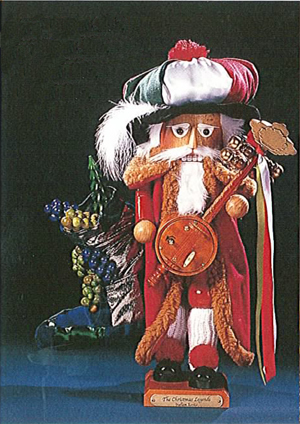 The Musical Tyrolean Santa (ES1762) stands at 18 inches tall. He is holding a staff topped with flowers native to the Austrian region, Blue Gentian and Edelweiss and plays a classic old world tune. This nutcracker has a red and white hat on his head with a white flower. The coat is green with tiny white flowers along the bottom. 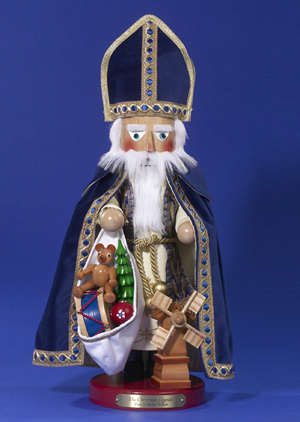 Steinbach welcomed the Dutch Sinter Klaas (ES1763) in 2007 becoming the fourteenth member of the Steinbach Christmas Legends Nutcracker Series. Every year on December 5-6 the Netherlands and Belgium celebrate Saint Nicolas Eve with a feast in Sinter Klaas’s honor. Sinter Klaas also known as Saint Nicholas. In the Netherlands, Saint Nicholas Eve (December 5) is the primary occasion for gift giving. They call this night “sinterklaasavond” or in English “presents evening”. The gifts are wrapped in ingenious ways and are called surprises. These “surprises” are traditionally accompanied by a poem from Saint Nicholas. 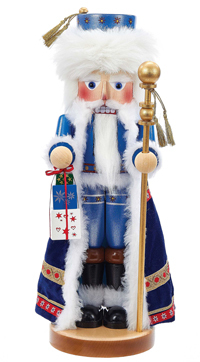 The nutcracker of Sinter Klaas is adorned head to toe in royal blue with gold edging. In his hand he has a bag filled with toys for the good boys and girls of the Netherlands. At his feet is an all-wooden windmill. This nutcracker’s eyes are a deep blue and his full white beard is as white as snow. 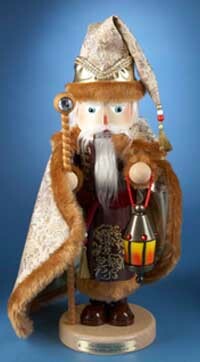 Steinbach introduced the sixteenth member of the Christmas Legends Nutcracker Series Czech Santa (ES1765) Nutcracker in 2009. In the Czech Republic Christmas celebrations begin on December 6th with a visit from St. Nicholas and end on January 6th with Three Kings Day. St. Nicholas is called Svaty Mikalas and it is believed that he climbs down to earth from heaven on a golden rope along with two companions: an angel and a devil. Christmas is a quiet and peaceful time in the Czech Republic. At midnight on Christmas Eve most families go to Holy Mass or Pasterka on Christmas Day. Christmas celebrations go on for three days, with people referring to December 25-26 as First and Second Christmas. This nutcracker is an exclusive limited edition of 7,500 pieces. Czech Santa Nutcracker is also signed by Karla Steinbach (ES1765SIG). “Florentine Santa” is the 19th member of the Steinbach Christmas Legends series, which celebrates versions of Santa Claus from around the world. Dressed head to toe in festive Florentine-style gold with fur trimming, this nutcracker is holding a jewel-topped staff and a bright lantern. 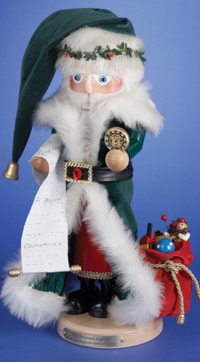 Standing at 17” tall, Florentine Santa is a limited edition of 5,000 pieces. Like all of Steinbach's creations, he is intricately crafted in Germany with the finest care and attention to detail. “Icelandic Santa” is the 20th member of the Steinbach Christmas Legends series, which celebrates a variety of international Santa Clauses. Dressed ornately in icy shades of blue and silver, this nutcracker is equipped with a wooden staff and a bag of gifts. 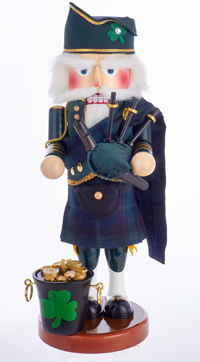 Standing at 19” tall, this nutcracker is a limited edition of 5,000 pieces. Steinbach’s Christmas Legends Series is inspired by Santa Claus figures from around the world, each with his own rich and distinct history and appearance. 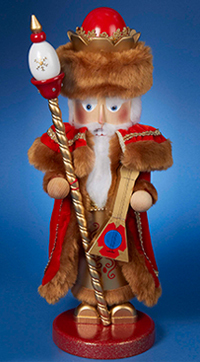 The 21st nutcracker in this beloved series celebrates Siberian Santa. Santa is dressed warmly and ornately in a rich red metallic jacquard weave robe, trimmed in gold faux fur and adorned with a gold metallic trim. Special details include a bejeweled crown, a staff and a balalaika for a festive touch. Steinbach’s Christmas Legends Series is inspired by Santa Claus figures from around the world, each with its is own rich and distinct history and appearance. 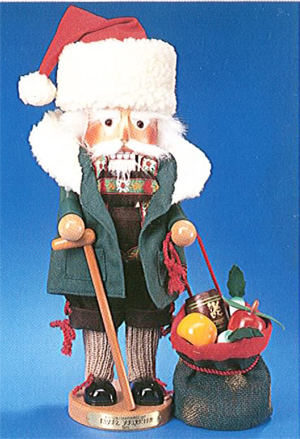 The 22nd nutcracker in this beloved series is the German Santa. 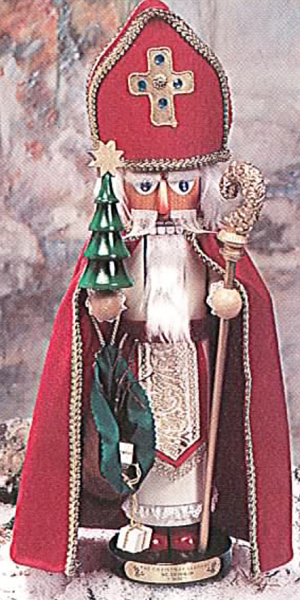 Standing at 17” tall, this Santa is wearing a festive German Black Forest red and white cape and hat. To complete the look, he is holding a tiny wooden nutcracker of his own, and a small wooden German cuckoo clock, both in festive shades of red, green, and gold. Steinbach’s Christmas Legends Series is inspired by Santa Claus figures from around the world, each with his own rich and distinct history and appearance. The 23rd nutcracker in this beloved series is Arctic Santa. Standing at 18 inches tall, Santa is wearing shades of blue and white, and is holding a golden staff and a small stack of wrapped presents. Like all Steinbach creations, he is crafted in Germany with the finest attention to detail. 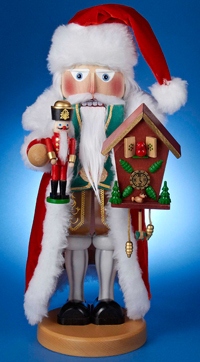 Decorate your home with this 18.5-inch Steinbach French Santa Nutcracker from Kurt Adler! 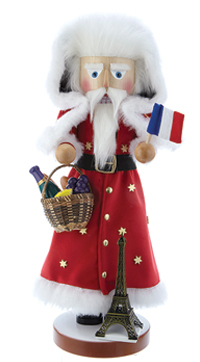 This nutcracker is designed holding a French flag as well as a basket filled with wine, cheese, grapes, and bread. By his feet is a miniature Eiffel Tower.